When you are a cookbook addict and you have more than your fair share of vegetarian cookbooks, what do you do? If you are me, you start buying baking books. I don’t remember when I bought The Greyston Bakery Cookbook and I don’t remember why. It is a fairly unassuming looking book. It doesn’t feature any of the gravity defying desserts that seem so tempting from other gorgeous books I have been fooled into buying. In a moment of unremembered inspiration, I brought home this sweet book and am I ever glad I did. In spite of the draw toward architectural and difficult desserts, the truth is that I like my sweets on the simple side. I like the challenge of making something involved but if I am going to sit down and eat a treat, simple is better for my taste buds. I don’t mean simple as in plain; I mean simple as in unfussy. If you are with me, this cookbook is a treasure. So often when I start opening my baking books looking for that elusive just-simple-but-still-delicious cake (like this one), I start to lose interest as page after page of time consuming sweets go by. Last night I had some friends coming over and, after our vacation, I was ready to bake. But I definitely wanted simple. I first picked up Tartine, the dessert book I chose for my Top 10 Desert Island cookbooks. Nope, nope, and nope. Then I remembered this book. Yep, yep, and yep. Grapefruit Yogurt Cake, Orange Poppy Seed Cake, Chocolate Obsession Cake. All tempting, all relatively simple. I decided on this Apple Torte. I was a little nervous about it turning out. I have made some of the bar recipes in the book and a fantastic cookie recipe but never any of the cakes. It could have been a mess. It was not a mess. In fact, I think it was amazing. The contrast in textures of the crunchy crust, the smooth cream cheese filling, and the soft but not mushy apples was amazing. And taste. The buttery richness of the crust, the fruity sweetness of the jam, the tang of cream cheese and the spiced and maple syruped apples was sublime. This is coming from an avowed chocolate lover – it is a terrific dessert. I’m officially changing that Top 10 list to include The Greyston Bakery Cookbook. Although this recipe is found in the cake section of the book, it is really more like a tart. Position a rack in the center of the oven and preheat the oven to 400°F. Grease a 9″ round springform pan. In the bowl of an electric mixer, cream the butter, sugar and vanilla on medium speed. Using a fork or your fingers, work in the flour until the mixture resembles coarse crumbs. Press the mixture onto the bottom and 1″ up the sides of the prepared pan. Pierce the bottom several times with the tines of a fork. Chill at least 30 minutes. Bake in the oven for 12-15 minutes, or until the pastry is set and golden. Cool on a wire rack. When the pastry is cool, spread the apricot jam evenly over the bottom of the crust and set aside. Using an electric mixer set on medium speed, beat the cream cheese with the sugar until light. Beat in the egg and vanilla. Spread the filling over the prepared crust. In a large bowl, combine the apples with the sugar, maple syrup, cinnamon, and cardamom. Arrange the apples in concentric circles over the filling. Bake for 10 minutes, then reduce the oven temperature to 350°F. 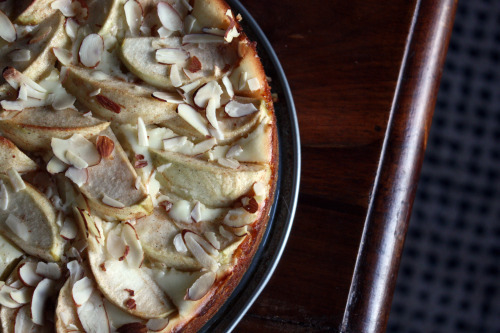 Remove the torte and sprinkle with the almonds. Put the torte back in the oven and bake an additional 30 minutes, or until the apples are tender. Cool on a wire rack at least 30 minutes. Release and remove the pan sides. Cool completely and then refrigerate until ready to serve. I have everything to make this at home, now I just need some baking time! Looks wonderful Dana! I’m new to your blog… I love it! You have such beautiful pictures!! This recipe has been officially bookmarked and the cookbook has been added to my amazon wishlist! I, too, often go for the really decadent and complicated desserts but they really need the right occasion, otherwise you’re sitting at home eating a triple-layer cake by yourself. Sometimes more simpler desserts are the way to go. Looks delicious. 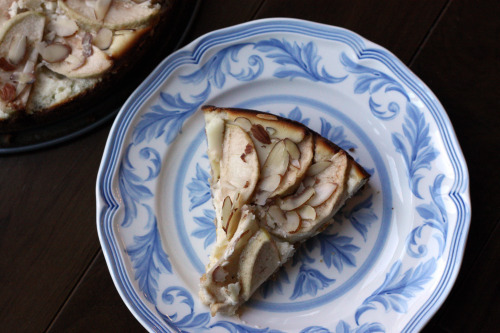 I bet the cream cheese makes this torte/tart/cake amazing! I love any apple dessert! I guess I need yet, another cookbook! This looks so good, its always nice to see a new and different apple dessert! I. too, am a cookbook addict — I think I have an older edition of this book and now I will have to dig it out and revisit it. But I believe it is Greyston without the “E.” I love your blog, btw, and have cooked from it — actually, so far I’ve baked from it: Orange Pound Cake, Eggnog Cake. This recipe could be next! Thanks!! I have never seen that cookbook. This is a great recipe. Simple and delicious. Not sure what I loved more – the recipe or your dessert plate! OK, I’m a sucker for any dessert made with cream cheese so I’ll have to try this one. Do you have Classic Home Desserts by Richard Sax? It’s really full of classics. You can browse it on Google Books but I think you’d like it. I prefer simple cakes too, probably bc I am not such a fan of frosting, and especially not all the time, although it has its moments. I will have to look for this book. A recent acquisition for me that has been similarly exciting is Lauren Chattman’s Cake Keeper Cakes–once again, none frosted, all simple. Hey which version do you have, the out of print Helen Glassman one or the newer one by Sara Kate Gillingham-Ryan? I made this yesterday and it was a big hit.